There is a bath rich personality of three hotel. Available in all charter without having to use care to others the bath three. Over the internal key, please time to enjoy with your family. small but you can experience pure Iwamuro Onsen. It is the open-air bath overlooking the cedar grove. 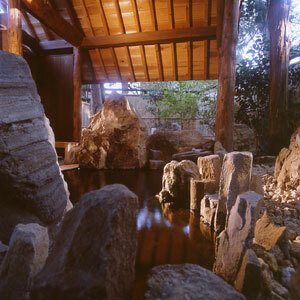 Open-air bath was made using a stone that was in the back of the woods for a long time. The pillars using the cedar of "Yahiko Shrine". Please enjoy fresh green in spring, autumn foliage, and the winter snow viewing. 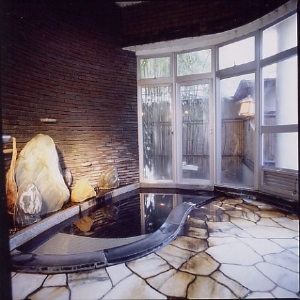 Medium bath “Reigan no Yu"
It is the indoor bathroom, which was built at the beginning of the Showa. This bath is characterized by stone with the taste and natural marble floor. Please enjoy the natural hot spring water of Iwamuro. Available in charter also family bath of slightly smaller. 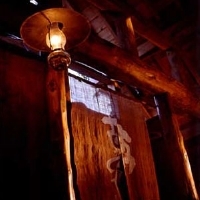 The Iwamuro Onsen(hot spring), it is called a "Reigan no Yu" from the legend says wild goose has healed the wound In the old days, has a history of more than 300 years.